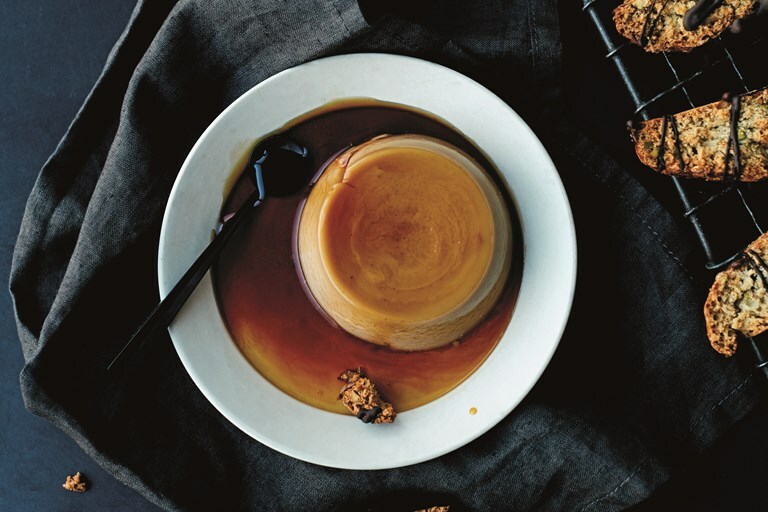 This vegan crème caramel recipe is spiked with espresso for a delicious dinner party dessert, served with pistachio biscotti on the side for a little extra crunch. This recipe is taken from Mildreds Vegan Cookbook, published by Mitchell Beazley. Images by Matt Russell. This is a proper grown-up dessert and ideal for a dinner party or special occasion meal, as it can be prepared in advance. In fact, the crème caramel is very much the better for being allowed to sit for 12 hours or more. You might think that since the main ingredient here is coconut milk it would have a coconut flavour, but we have found that the coffee and caramel neutralize it. Some people are intimidated by the concept of caramel, but it’s very simple to make if you don’t fiddle around with it too much. Never stir or whisk caramel as it cooks or the sugar will crystallize around the edge of the pan and you’ll end up with a lumpy mess. Also, you must work fast once the caramelization occurs, as the sugar will continue to cook otherwise. The sugar is very hot once caramelized, so it’s best not to have kids around while you’re making it, and don’t be tempted to stick your finger in it to taste. The biscotti are a little extra effort, but they are a simple biscuit to make and keep for ages. We have two Italian lads (non-vegan) working in the bakery and they love these – enough said!